Added by admin on August 11, 2018. The American space agency (Nasa) is all set to launch one of the most daring ventures in its history. It’s going to send a satellite closer to the Sun than any mission has done before. The Parker Solar Probe will dip directly into our star’s outer atmosphere, or corona. The spacecraft’s data promises to crack longstanding mysteries about the Sun’s behaviour – assuming it can survive roasting temperatures above 1,000C. Parker will begin its quest with a ride on a mammoth Delta-IV Heavy rocket. This powerful vehicle is scheduled to lift off from Cape Canaveral, Florida, at 03:33 local time (08:33 BST) on Saturday. The Delta will hurl the probe into the inner Solar System, enabling the Nasa mission to zip past Venus in six weeks and make a first rendezvous with the Sun a further six weeks after that. Why is this mission important? Parker will help us better understand how the Sun works. The star is constantly bombarding the Earth with charged particles and magnetic fields. This perpetual flow, or “solar wind”, is responsible for generating the beautiful auroral lights that appear in polar skies, but there are some interactions that initiate much more troubling effects. 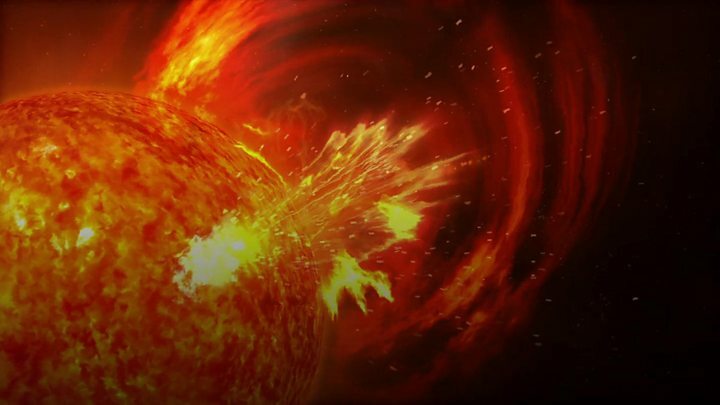 The biggest outbursts from the Sun will rattle the Earth’s magnetic field. In the process, communications may be disrupted, satellites can be knocked offline, and power grids will be vulnerable to electrical surges. Scientists try to forecast these “storms” and Parker promises new and valuable information to help them do that. Why go so close to the Sun? Parker wants to get where the action is. The corona is a remarkable place. It’s strangely hotter than the Sun’s actual surface, or photosphere. While this can be 6,000 degrees, the outer atmosphere may reach temperatures of a few million degrees. The mechanisms that produce this super-heating are not fully understood. Likewise, the corona is the place where the solar wind gets its big kick in speed, sweeping out across the Solar System at more than 500km/s (a million mph). Parker aims to solve these puzzles by directly sampling the corona’s particle, magnetic and electric fields. A mission like Parker was first proposed 60 years ago, but it’s only now that engineers have the technology available to keep a probe safe so close to the Sun. Nearly everything on the spacecraft must sit behind an 11.5cm-thick (4.5in) carbon-composite sunshield. This will maintain all parts behind the barrier at a tolerable 30C. The probe is solar-powered – obviously. But that in itself is a challenge because the solar cells will have to be moved into sunlight to work and they hate high temperatures. So, Parker’s arrays will be water-cooled, with the onboard computer system constantly adjusting their position so that only the minimum surface area absolutely necessary to generate power is exposed beyond the shield. Autonomy is also crucial for this mission. Close to the Sun, the radio interference is intense, and Parker will be out of contact. The probe must manage any faults itself. Above all, it has to keep the shield always pointing at the Sun to avoid being destroyed. The European Space Agency has its own version of Parker. Solar Orbiter, or SolO as it’s sometimes known, is undergoing final assembly and testing in the UK. It is expected to launch in 2020, arriving at its closest position to the Sun towards the end of Parker’s planned seven years of operations. SolO will go to within 42 million km of the Sun’s surface. That’s further away than Parker but it will still need an impressive shield. Being at a more distant position, though, means SolO can do things Parker cannot – like look directly at the Sun. This enables the pair to do complementary science. “Parker Solar Probe will get close and sit in – and make measurements of – the material coming off of the Sun. 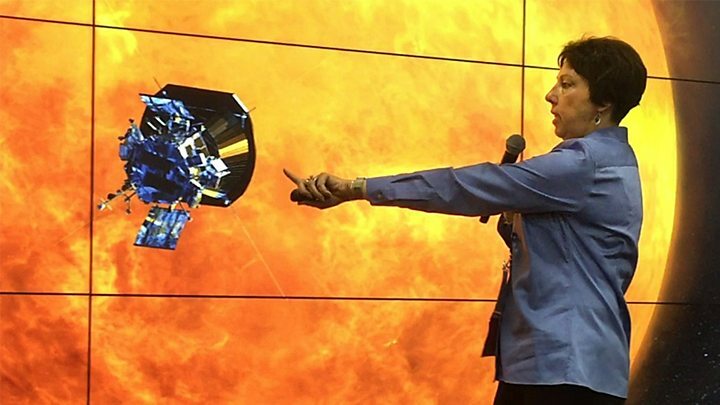 Meanwhile, Solar Orbiter, from its position, will make those measurements, too, but it will also be able to take pictures and it will be able to look at where the emissions are coming from,” said Prof Lucie Green, from the UCL Mullard Space Science Laboratory in the UK.